Spring is a season of change and transformation – from cold to warm temperatures, from shades of gray to bursts of color, from shorter days to longer days. The spring season brings sunshine, new growth, and a fresh outlook. 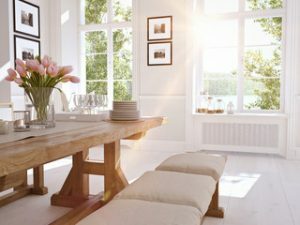 If you are preparing to sell your home this spring, these five décor styling and spring staging tips can help you engage buyers with a cheerful, welcoming, and warm environment. Scrub your home until it sparkles. Freshen up the interior by putting away your winter wardrobe, organizing, and de-cluttering the space. De-cluttering will make your space feel airy and spacious. To avoid the perception of limited storage, do not jam your clutter into your closets rather keep your closets organized. Ensure a clean exterior appearance by power washing your siding and sidewalks, washing windows, clearing winter debris, cleaning up the gardens, and pruning tree and shrubs. A fresh coat of paint on your front door can create a welcoming first impression. Consider diagonally mowing your lawn to make your yard appear larger. Embrace new beginnings by integrating floral prints, bright colors, or spring flowers. Consider accenting colorful artwork, decorations, pillows, throws, glass bowls filled with fruit, and other accessories against a neutral backdrop to add warmth and energy to your home. Replace your darker winter towels and wash clothes for brighter, colorful towels and wash clothes. Let the natural light in and brighten up the space to make the room feel larger. Consider bringing in plants of any size or shape to bring in a splash of color and make the home buyer feel closer to nature. Odd-number pairings, especially threes, tend to be more appealing to the eyes. Bringing in the spring aromas is one way to ensure that your house smells amazing when buyers visit. Lilies or peonies can add a fresh, spring scent to your space. Lemons are a great natural deodorizer that also add a splash of color to your kitchen. If you prefer non-perishable items, consider using a candle warmer or diffusing essential oils. These spring staging tips will help you create a warm, lively, and cheerful environment where buyers can image their new lifestyle and the possibilities. Spring is a great time to be selling your home.